Core Blend Training has always strived to provide the best possible group classes for its clients. The classes have evolved from group workouts with everyone doing the same thing, to differentiating exercise selection for different people, offering different programs based on the number of days people were attending, to now offering bias programs. It is not something I’ve ever seen done in a group class, but it’s a natural evolution of what we’ve been trying to do. We want to provide a one on one experience in a group class setting. Different programs have already been designed for 2,3,4, or 5 day a week participants, but now we’ll offer 3 different plans for each class schedule. Core Blend Jacked is most similar to what people have been doing in classes already (and that Corey has used for years). It is built for people that care equally about strength, aesthetics, and cardiovascular performance. In short, if you want to be a “jack of all trades” Jacked is for you. If you want to lift heavy AND look like you lift, Jacked is your program. Core Blend Defined is built for people that have the goal of improving muscle definition through a combination of strength moves, bodybuilding, and cardio. Taking full advantage of all of our cardio equipment, bodybuilding machines, and advanced intensity techniques the Defined program is perfect for someone trying to feel their best. Core Blend Fortified is a program that takes full advantage of our extensive powerlifting equipment and pushes people to get as strong as they can be. The focus is on building a body that is ready to move powerfully in any direction and handle any physical task thrown at it. These are bias programs. Someone with excess weight would be expected to lose weight on Core Blend Fortified even though that isn’t the primary goal. We would expect someone to get stronger on Core Blend Defined. Pick the program that will be most enjoyable to you and helps you reach the goals you value most. You can change programs and switch at any time (ideally at the end of the program, but it’s up to you). Although people will spread out during the beginning of the class, the final 20 minutes of the class will be doing cardio together. Like before, this will be a combination of group, partner, solo, long, and short bouts of work. You will have 40 minutes for warm up and your goal specific workout before the trainer brings the group back together for the cardiovascular finisher. Q: You’re expanding the gym? 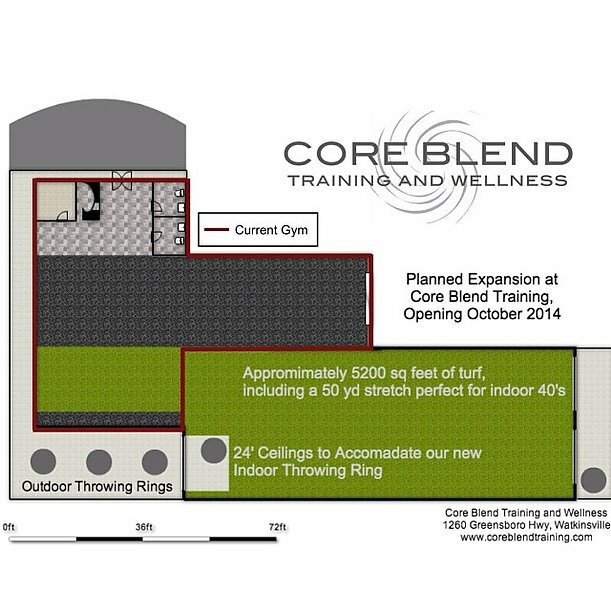 A: Yes, October 1st we are scheduled to open up a big expansion to Core Blend Training. It’ll be a 105 foot by 40 foot turf area to supplement the rest of the gym. Q: What will it look like once it’s done? Q: How big will Core Blend be after this is done? A: Roughly 9000 square feet. Q: Will you raise prices to pay for this? A: No. We’ve expanded the gym twice already and bought tons of new equipment and never had to raise prices. If you’re coming to the gym before October 1st, you’ll be grandfathered in. It is likely that we’ll change our prices for new customers coming in after October 1, but they’ll still be fair. Q: What sorts of things will athletes be able to do on the new turf? A: We will continue to be able to do speed and agility work, but it’ll no longer be dependent on the weather. There will be a strip of turf that is 50 yards long, so we’ll be able to run indoor 40 yard dashes. Reese Hoffa will have an indoor shot put ring,, so he’ll be able to coach throws inside and also practice for his professional season at the same place he does his lifting. There will be an indoor basketball goal to work on shooting and to have some fun with after workouts. The 24ft ceilings and space will allow for a variety of throws inside. We’ll also have hurdles to work on mobility. Q: What sorts of things will personal training and boot camp clients be able to do? A: We’ll be able to push sleds farther (yay! ), we’ll be able to do a few more running exercises as part of circuits, we’ll do a couple of circuits that take up more space. Not a huge change for these groups though. Personal training clients very rarely are looking to work on quickness. 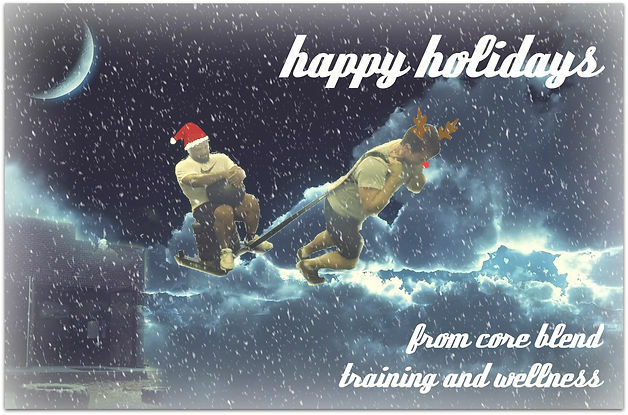 Thank you for helping to make this year a success for everyone here at Core Blend. Wishing you and yours a happy and healthy holiday season. Thank you for voting Core Blend Training the Athens Banner-Herald/OnlineAthens Reader’s Choice 2013 Best Gym and Best Weight Loss Program in Athens! Full list of winners is here. Core Blend Training is a powerlifting, athlete training, Olympic weightlifting Gym. 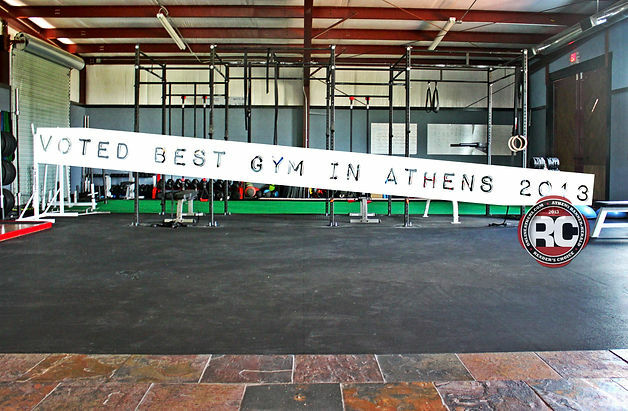 Voted Best Gym and Best Weightloss Program in Athens in 2013. Core Blend Training client Reese Hoffa celebrates his Bronze Medal in the Men’s Shot Put final at the 2012 London Olympics. Congratulations, Reese, on an amazing performance! Core Blend Training client and Diamond League leader, Reese Hoffa, wins his third event. Great win, Reese. Looking great for the Olympics.